Hello Lovelies! 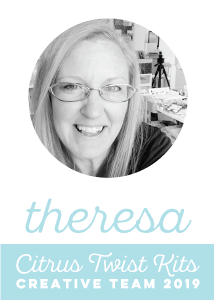 Theresa here today with an Introduction page in my Life Crafted album. The very first thing I noticed about this beautiful album is how it feels just like it came from the library, with its fabric cover and classic details. You are going to love having this album on your shelf! Here is how I decided to open my album. My plans for this album are to include stories about my journey right now, some of the important work I am doing personally, and also some of the things I find inspiring. So it seemed important to create an introduction layout about myself and how this is a new chapter for me. 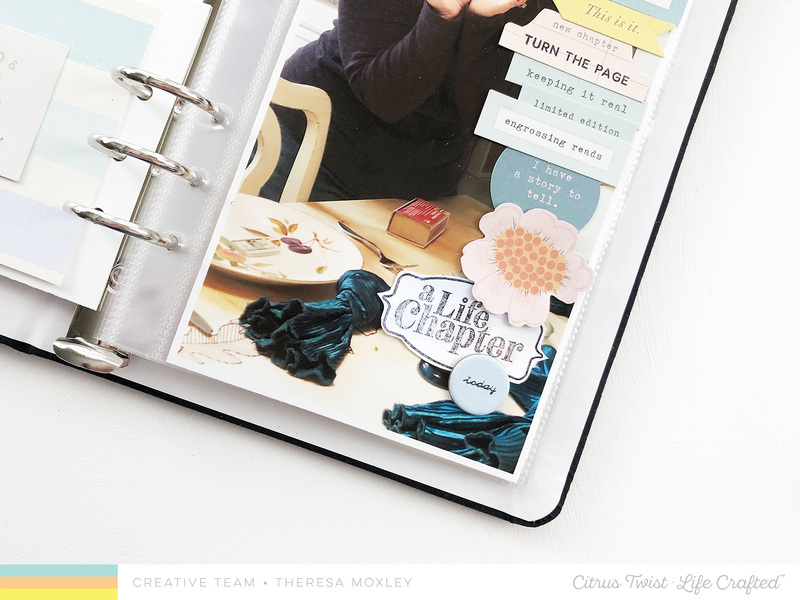 The March Life Crafted kit provides so many beautiful opportunities and products for this! I began my process with watercolors to create a background for stamping. Then I stamped a few labels using the This Is Life stamp set plus the stamp set in the Life Chapters kit. The background makes these stamps pop! One of the labels I have used as a layering piece on my journaling pocket. I also added one to my embellishment row over my photo. I am loving the vertical format of this album and I decided to play that up with the elements I added to the photo. It started innocently enough with just a few embellishments at the bottom of the photo, but then I discovered the banner at the top and then I couldn't stop! Don't you just love when your products make you want to keep going? Something else that really inspired me were the bookend stamps in the This Is Life stamp set. I don't normally alter the insides of my albums but I did here and I love how it turned out! I created an embellishment cluster by first stamping an image to ground the cluster to the page, and then added a word strip, a label, my title, and the pencil. I also stamped the bookend swirls in the corners. One other detail I wanted to share is when you flip the pocket. I added the purple and blue stripes and layered a simple tag from the embellishments for the simplest treatment. Here is one last look at this layout. Thank you so much for joining me today! I hope you are inspired to use your March kit this month! See you again soon!